Whether it’s business files or personal photos, videos and music, you’ll be able to save it all with the stylish HD-B1 1 TB external hard drive. The super-fast transfer speeds of 5 GB/s (via a USB 3.0 connection) and 480 Mbps (via USB 2.0) make saving files easy, while preloaded automatic backup software keeps them secure. With the trust of Sony, you can use this HD-B1 External Slim Hard Disk to expand your PC’s internal memory. Its huge 1 TB storage space provides you with a resourceful reservoir to accumulate your data for rapid anytime access. The HD-B1 External Slim Hard Drive gives you the requisite flexibility and portability to move around with your data for swift access from your multiple devices. You also acquire a secure back-up solution for an easy retrieval to prevent permanent data-loss. This HD-B1 External Slim Disk connects with your desktop or notebook PC via a USB 3.0 transfer interface. Your data gets transferred and stored into the External Slim Hard Disk blazing-fast. It is also an equally rapid process to access this data from your personal computer with this External Hard Drive connected. With its USB 3.0 transfer interface, the External Hard Drive offers you 5 GB/sec high-speed performance and its backwards-compatibility with USB 2.0 transfer interface features 480 Mbps pace. The External Hard Disk also comes with the NTFS formatted file-system to offer you its improved efficiency and security for a reliable back-up of your data. You can utilize this External Slim Hard Drive for both Windows and Mac desktops and notebooks. It supports a wide compatibility range with 64/32-bit Windows 8.1, Windows Vista, Windows 8, Windows 7 and Mac x 10.8 or above operating systems. 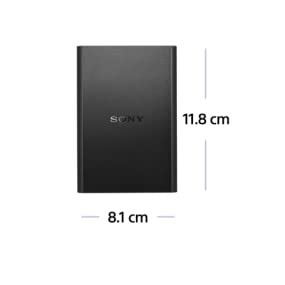 Compact and light with 81 x 17 x 118 mm dimensions and 180 gm weight, this External Slim Hard Disk is also portable to let you carry it where you like for a safe data-storage.